I left for a visit to the Chicago Flower and Garden Show on Friday and the front bed was devoid of greenery — just dirt and old leaves. Not surprisingly given our warm winter, I came home to lots of tulip shoots poking their noses above the soil. Since I started this blog in the fall of 2007, this is the fifth time I have noted the arrival of tulip foliage and it is the earliest date for noticing it. However, it is not as early as I thought it might be compared to previous years. 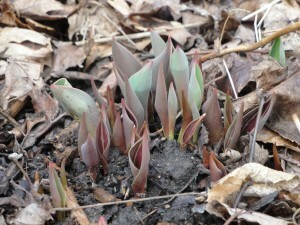 The latest date that I recorded tulip foliage being up was in 2008, when it arrived March 30. In 2009, the arrival day was March 15. In 2010, March 16 and last year, despite a lot of snow cover, March 19. I find phenology — the study of nature signs — fascinating. Both my husband and I have noticed that the birds seem to be more present since this weekend, and each of us have seen red-wing blackbirds and robins around. Over at my friend Penny’s blog, you can see pictures of the swans and ducks that are coming through the area. This blog has been a great way to make notes of what’s happening in my yard.